Floriculture businesses must be equally adept at marketing their crops and managing the business to generate a profit and justify the financial investment. Without the latter two components, a business will not survive. New businesses should realize that it usually requires 3 to 5 years for the business to show a profit and owners should plan accordingly. Prior to starting a business, a number of considerations must be made. The first step is to determine if you have the right personality to own and operate your own business. Visit with people who already own their own businesses. Are you ready for the time, responsibility and commitment required? Analyze your strengths and weaknesses. Are you a natural grower, people manager, or sales person? Do you dislike managing people or handling customer complaints? Enlist the opinion of family and close friends to help you evaluate your skills and deficiencies. You do not need to be able to do everything well but you must be able to hire or partner with others who have the skills and traits you lack. Obtain sufficient capital to start the business and operate until it makes a profit. Unless you are quite lucky, your business will not make money the first year and may not for several years. You must not only have enough money to keep the business operating until it is profitable but also to support yourself, and possibly your family during that time. Even after the business is profitable, it may not make enough money to allow you to pay yourself enough to live on for several more years. Field cut flower production operations typically do not require much initial capital but a number of major expenses might be needed (although, not all at once generally) including irrigation, cooler, greenhouses for propagation or production, hoop houses, and delivery vehicle. Determine if there is sufficient market for the products or services your business will offer. If you are selling to the general public, are there enough customers within your area to support your business? Define the area you intend to reach. Direct retail will depend on people who can readily drive or walk to your business, which generally means that you must be in or close to a metropolitan area. Selling wholesale may allow you to reach a broader area, such as a hundred mile radius, but will require you to deliver the product. See the next point also. Is there demand for the products or services your business will offer? Your potential customer base may be large enough but may not be able to support your business if there are too many competitors already in the market. Analyze your competition. Are there products or services that they do not offer? Define your niche – in other words, why will your customers buy from you rather than from someone else? Remember lower prices will not work in the long run. That strategy only works for large companies who can produce or sell large amounts of products and services and make money through economy of scale. It may be wise to list out two types of customers. The primary customers are those who you anticipate will buy most of your products or services. They are the ones that you will direct most of your marketing towards. Secondary customers are those who may purchase some of your products and services but not in large enough amounts to support the business. You should always consider your secondary customers, especially in case your primary customers fail to support your business, but do not pay so much attention to secondary customers that you lose your primary customers. For example, a cut flower grower may target florists as there primary customers and have wholesalers or a grocery store as their secondary customers. The following are options for marketing outlets. Growers use the following marketing methods to sell product directly to the public. Farmers markets are a relatively easy marketing method for new growers of cut flowers. Overhead costs are generally low and most, if not all, of the advertising and organization duties are handled by the farmers market organization. The time spent selling product is usually limited as farmers markets are only open for a few hours a day and a limited number of days each week. Customers expect to buy directly from the producer and typically are not as concerned about packaging. Prices can be high because the product is considered fresh from the grower; however, in some cases they may be lower if customers are expecting a Abargain@ by buying directly from the grower. As with farmers markets, the overhead costs on roadside stands are usually low. The stand can be operated directly from the growing location (see also on-farm sales, below) or can be set up at a highly visible location near or in population centers. 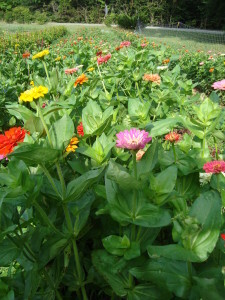 Often bedding plants and fresh and dried cut flowers are sold with fruits and vegetables. The floriculture crops are compatible with the edible products in that the bright, eye catching colors of flowers can alone bring in customers. As with farmers markets, prices can be high, depending on customer expectations. On farm sales have been developed more extensively in the fruit and vegetable industries but are readily applicable to floriculture. On farm sales can range from something as simple as a roadside stand to a pick your own field cut flower operation to a fully developed family entertainment center with animals, areas for children, tours, and educational displays. Floriculture crops such as cut flowers or bedding plants are often sold with fruits and vegetables. One appeal of on farm sales is being able to manage all aspects of the business from the farm. Of course, the drawback is the need to maintain the farm in a highly presentable condition. Location is especially important as the general public must be able to easily locate the business, yet retain a rural image. The traditional florist shop is a major outlet for cut flowers. Florists sell large amounts of cut flowers and foliage, usually in the form of flower arrangements. Florists also sell decorated potted flowering and foliage plants. Much of the florists sales are based on events such as holidays, birthdays, funerals, anniversaries, and parties. In addition to local sales, florists act as agents for nationwide floral wire services, such as American Floral Services (AFS) or Florist Telegraph Delivery (FTD). To send flowers to a friend or relative in a distant location, customers contact their local florist who wires or sends the order to a florist in the second location. Mass market outlets are those companies including grocery stores, department stores, and other stores that sell plant materials as part of a broad range of items. Although the cut flowers may be an important part of the business, they rarely constitute the majority of sales for the business. The commitment to floriculture sales by mass markets ranges from a few buckets in the vegetable section to full service florists or garden centers that operate the entire year. Mass markets often focus on daily or impulse purchases. A large portion of floriculture products are sold through mass market outlets in the United States. Wholesalers bring in product from numerous growers allowing the retailers to obtain all, or most all, their cut flowers from one location. From the grower=s point of view, prices received from the wholesaler tend to be low, but so are marketing costs. The price per unit must be recovered by efficiently growing and selling large volumes of plant materials. Wholesalers are also concerned with buying from reputable growers who will be able to deliver a consistent and high quality product. • Why Do We Need Clean Sweep Programs?